I had been looking forward to dinner with friends at Kirazu for weeks. 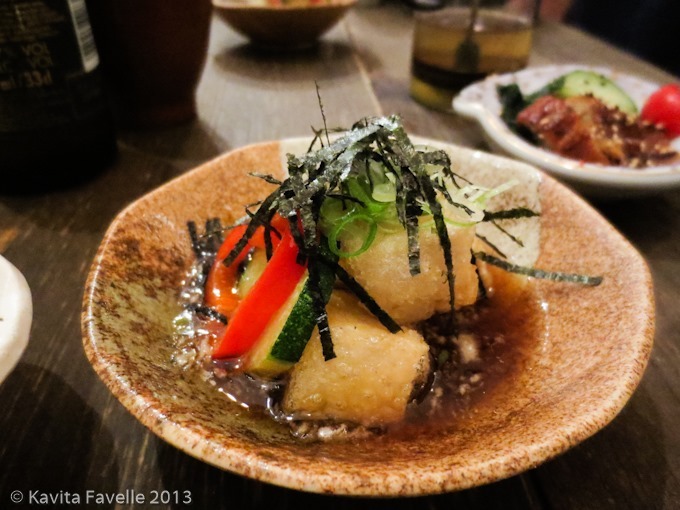 This tiny Soho restaurant describes itself as “Japanese Tapas” – a cross-cuisine shorthand (for the small dish menu) that is guaranteed to drive my friend Mr Noodles to near apoplexy. Reviews since its launch in April seemed positive and one of our group had been before, for the ramen, and deemed it good. The handful of dishes shown on their blog looked appealing. But although much of the food was decent, the overall experience was hugely disappointing. Our booking for seven was allocated a space suitable for five. When we pointed this out and suggested we’d need the two neighbouring places too, the staff were very put out and insistent that this was not possible, though they could clearly see that we could not physically squeeze any more people onto our given benches. All the more surprising, given that the restaurant was not fully occupied during the entirety of our visit; neither the two extra seats we requested (and ultimately used) nor the two next to them were taken. I’m usually pretty sympathetic to staff for whom English isn’t a first language, as long as we can communicate eventually. When they are from the country of the cuisine being served, the language issues are balanced out by their helpful familiarity with the ingredients and dishes. But at Kirazu, language barriers made the process inordinately difficult. Even asking how many dishes we might need for our group size was challenging, and I gave up after a few attempts to explain the question in different ways. Asking for information about the actual dishes was impossible. And, despite there being more than enough waiting staff for the tiny number of customers, it was far harder than it should have been to catch their attention, perhaps because each interaction with customers was an ordeal for them too. With just one chef, service was very slow. It took a long, long time for our food to come out, and when our two late-arrivals ordered a handful more dishes, some never turned up at all, despite chasing. But most frustrating of all were the portions. While the use of the word “tapas” does give an indication, Kirazu made the diminutive size of its dishes an art form. Take a look at the picture of Sautéed Lotus Roots (£2.50) from their website (on the left), alongside mine (on the right), showing the portion we were actually served. The friend who’d been to Kirazu before commented that the serving had been twice as large on his previous visit. Agedashi Tofu (£4.50) was similarly minuscule; those cubes are small! It was a decent example of the dish but by no means among the best I’ve had in London. 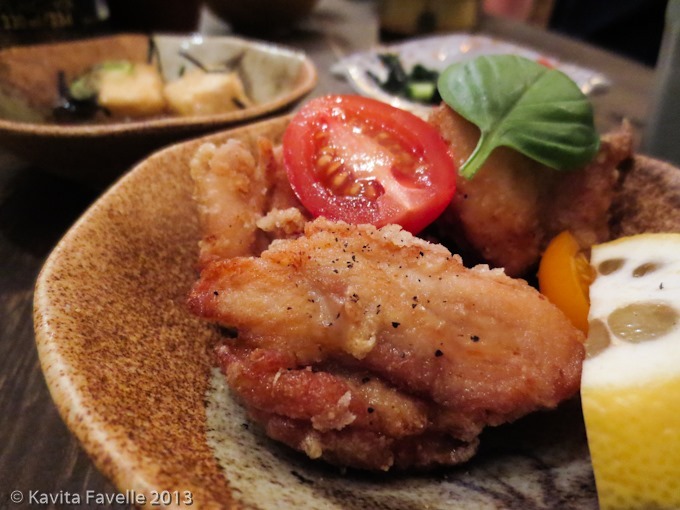 Chicken Karaage (£4.50) was hot, juicy and gone in a flash. 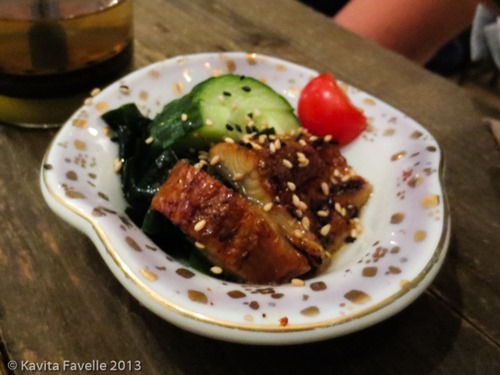 Grilled Conger Eel & Cucumber (£4.50) was, once again, tiny; what was there was decent. A Seaweed Salad with Sesame Dressing (not pictured) (£4) was OK, but uninspiring. The dressing was mediocre. 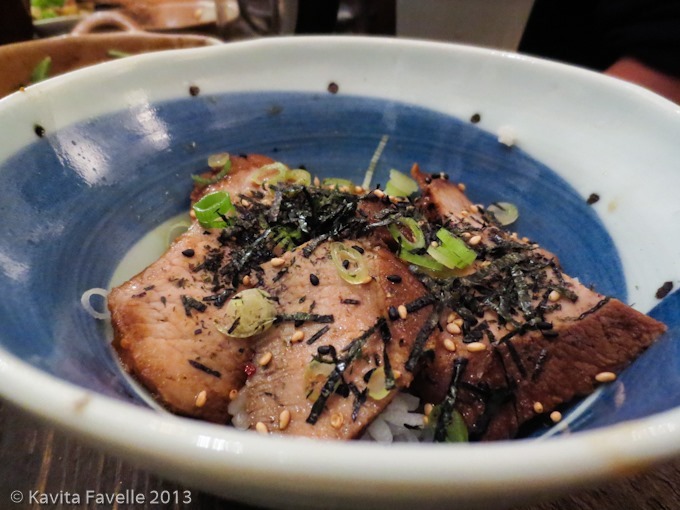 Mini Rice Bowl, topped with seared roasted pork (£6) actually made us giggle – you know the kind of giggle that’s covering up utter disbelief? At the bottom of a normal-sized bowl was an inch of rice (come on, how cheap is rice, for goodness sake? ), a trickle of sauce and 4 miserly bites of pork. And the pork wasn’t even very good; I found it dry and a little bland. One of the best dishes we ordered was Takoyaki (£3.50). These batter balls with octopus inside were served freshly made, meltingly soft and piping hot such that the heat caused the generous sprinkling of bonito flakes on top to swirl and wave like living organisms. Beautiful and delicious. 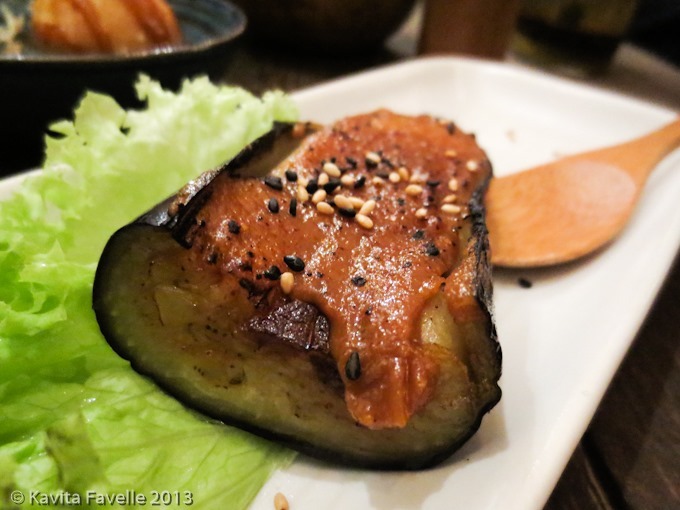 The worst dish in our selection for me was the Grilled Aubergine with Sweet Miso Sauce (£4.50), usually one of my favourites. A small piece of aubergine with tough skin spread with a thin layer of rather bitter miso in place of the usual sweet-savoury miso marinade that marries so well with smoky aubergine flesh. It hadn’t been grilled long enough after the miso was added either, so the miso was dull and lifeless rather than charred and bubbling. Having ordered tea to drink, I asked for more hot water in my cafetiere once I’d emptied it. Not only is refilling tea standard practice in Japanese restaurants, the second brew is often even better than the first. I was very haughtily informed that they don’t do this, and the waitress turned away before I could respond. We ordered the dishes I’ve described as a first round, intending to order more as the evening went. But as the dishes slowly came to the table, and we realised how tiny they were, not to mention the lack of welcome in the service, we decided to draw a line under our visit and head elsewhere for something more filling, tasty and better value. Even then, our frustration wasn’t over. Again and again and again and again we asked for the bill. When we finally received it, we were not impressed to see it hadn’t been itemised, so no way to check whether it had been collated correctly. 23 Comments to "Kirazu, London – I wish I hadn’t bothered"
Oh dear – doesn’t look like my cup of tea at all! Sounds like a disaster from start to finish! Such a shame, could have been great! Oh goodness yes, I had forgotten that! I heard you say that at least once even from my end, opposite end of our group to your end!!! I don’t know what the reason for the portion sizes was… we didn’t bother asking because given how hard it had been just to order, it didn’t seem worth the ordeal to try! That sounds like a disaster. I’ve been wanting to visit this place but won’t bother now. Some people have liked it… but I would definitely not go back. Wow! Awful. Glad you shared the experience, but sorry you had it! I love the side by side comparison of their dish website photo v what they actually served you. Well done; sounds like one place I can safely avoid. Even if the takoyaki were OK, a deep fryer can hide many sins. Sounds like a grim experience. A real shame because it could have been great… was very disappointed. Yeah….pretty much sums up that evening for me. The service was laughable and the potions were minute, I could have easily eaten the whole lot by myself and more. And don’t even get me started on that rice bowl….I was gobsmacked when that arrived! 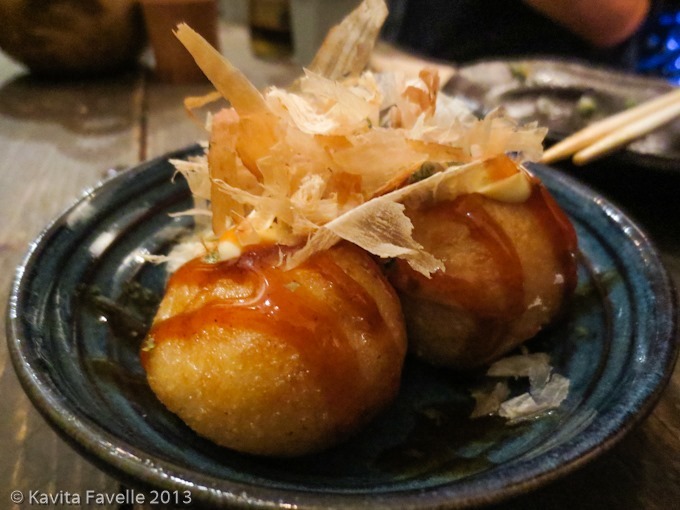 Takoyaki was my favourite on the night too, and the only one that was generous in portion. Glad I’m not only one that thought that – could have eaten entire lot and still been a bit hungry! Oh that is just so sad, as there was probably someone with talent slaving like mad in the kitchen. Sounds like they have been let down badly by all kinds of crazy ‘policies’ over portion size and the dire service. No hot water! Oh my goodness. I hope you got some more to eat somewhere a bit more welcoming after. Yes, I imagine that there is certainly talent here, but it’s not being allowed to come through, or wasn’t during our visit. There are signs of talent in the kitchen e.g. the takoyaki and kara-age chicken but the overall experience was let down by the service. While I usually hate the ‘let me explain our concept’ spiel it would have done no harm for the FOH to explain the menu and how much food we needed to order. And by god, that rice bowl was the biggest piss-take I’ve seen when eating out in a long time. You could get a plate of cha siu rice at Chinatown for the same price with much more pork and rice! PS: I haven’t even mentioned the use of the word tapas, well until now anyway! I agree, that kind of basic intro would be useful. Of course, given how many dishes you’d actually need to order to feel full, they may shy away from that given that people will realise how pricy it would work out and be put off! The fact that you recognised the potential in such a place, were game to try it, and calmly and analytically reviewed it is much to your credit. Reading about it, though, makes me want to invite you and the rest of the party of seven over for sarnies. Really and truly. Kirazu is very interesting as I have been on several occasions on my own for the ramen noodle dishes which were excellent. However, I was dining with Kavey this night and the service was pretty poor. Ican confirm they did try to push us into the tiniest space for 7 people. I was the person who visited before and had the lotus root dish which was already small. This time the sizes had shrunk further. The portions of “Japanese Tapas” are now beyond tiny! The same size as the smallest canapés I’ve ever had. The waitresses’ command of English is extremely poor. Maybe because I’ve travelled extensively on business I’ve had more experience crossing the customer-waiter language barrier. Somehow I seemed to understand them better than many of the others in the table. However, is was a definite issue. As a group, definitely not. On my own, yes. If you just want ramen, and want to visit when they’re not busy, and have no questions whatsoever about anything on the menu (I.e. you don’t have to ask communicate with the waitresses beyond pointing to menu items to order) this is still a place I would revisit. I would like to comment though that I’ve travelled very extensively for 40+ years, and am regularly complimented on my ability to communicate even through a language barrier, when there’s no mutually known tongue. When people are willing, I’m able to get through to them and understand them in return. In this case, the staff neither had the interest nor the skills to do so, and it was not conducive to a pleasant evening with friends to try and push past that.